Chinchillas are vegetarians, have sensitive stomachs, and require specific foods to maintain their health. They are also animals that partake in coprophagy, meaning they eat their own feces. This practice is completely normal and necessary for them to get important nutrients. A well balanced and nutritious diet is the easiest way to make sure your pet stays healthy. Luckily, there are many excellent chinchilla foods available, so taking care of your pet is easy. Below is a list of many foods you can feed a chinchilla. Commercial foods, made especially for chinchillas and produced in pellet form, are available in pet stores. Pellets are designed so your pet can easily eat them and include the correct amounts of protein, fat, and roughage. Food should be available at all times. Hay provides the roughage your chinchilla needs and is a very important part of his daily diet. It also can aid in wearing his ever growing teeth. Timothy or Alfalfa hay is a good choice. Always use fresh, clean, and dry hay. A hay rack is a good way to make sure your pet has a steady supply of clean hay. Your pet should always have a source of fresh water. A stoppered water bottle is a great way to supply water. 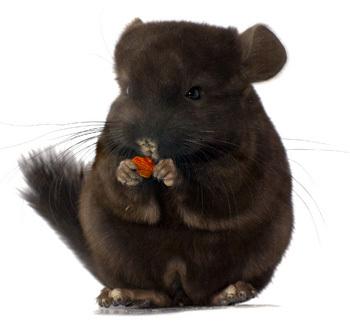 Chinchillas love treats, but they should only be fed occasionally. There are a variety of treats available from pet stores that a chinchilla would love. Dried rose hips, hibiscus, and dandelion leaves all make wonderful treats. Nuts, seeds, and dried fruit are greatly enjoyed by chinchillas but should be fed sparingly or avoided. They are fattening or high in sugar and may cause digestive problems. Salt blocks or wheels are good for chinchillas. They can supply essential minerals that your pet may be lacking. A vitamin C supplement can also be beneficial for your pet. Although chinchilla pellets should have everything he needs, a supplement is a good way to guarantee it. There are vitamin C supplements that can be easily added to your pets water.